Much like Facebook with those status updates, individual tweets are easy to remove – as long as you have the time and patience to go through each one and remove them. Unfortunately, flushing them all out and starting a fresh isn’t so easy, and although there are plenty whom I like to call ‘hoarders’ – people who wouldn’t dream of deleting a tweet – there are also scores of folk who prefer to keep things less cluttered by having a spring clean now and again. There are many other reasons why you might like to delete all of your tweets in one go. Over the past couple of years, there’s been an uprising in employees getting called to the boss and sometimes sacked over things uttered over social networks – often in the heat of the moment. Of all the social hunts, Twitter is probably the most ‘here and now’ focused – meaning most tweets made the previous minute/hour/day are often rendered obsolete. As a result, you may want to get rid of your now-useless murmurs, and, as per usual, there’s an app for that. 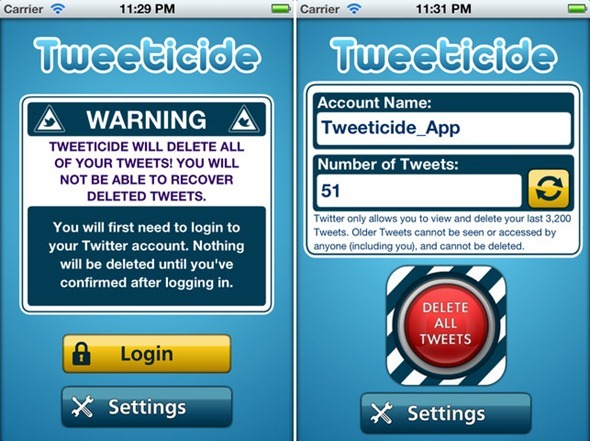 The humorously-entitled Tweeticide allows you to purge all your <140’s from the beginning of time to the present moment at the click of a button. Whilst Facebook remains the undisputed king of the social networks, Twitter continues to grow popular – and is seen by many on mobile devices as the easiest way to share their thoughts with the world. 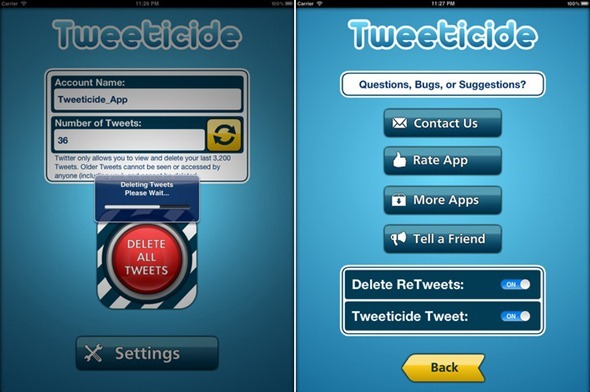 As a result, Tweeticide is just the latest of the many hundreds of Twitter-related apps and tweaks available for iOS users. Please bear in mind, though, that while Tweeticide erases all of your tweets on display to the public, Google’s cache may continue to pick them up for a short while afterwards. Furthermore, Twitter struck a deal with U.S. Library of Congress which now means undeleted tweets of over 23 weeks old will be sent to the Library of Congress for purpose of ‘archiving’. So unfortunately, whilst some of the older tweets will be out of sight and essentially, out of mind, they’ll forever be in the hands of the US Government. If you wish for tweets not to be a part of the archive process, simply include #noloc in your tweet. 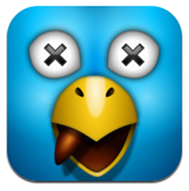 Tweeticide will set you back 99 cents over at Apple’s App Store (link below).